The new iPad Pro is arguably the most powerful, most familiar, most versatile, and most fun computer you can get today. Yes, you read that correctly. I said computer. For the past week, I’ve been testing out Apple’s latest 12.9” iPad Pro. I’ve used it around the house, and at work, in the kitchen, and in bed, at the coffee shop and on the couch – and it’s been great. I actually look forward to using it, and it has replaced both my MacBook and my iPhone for a lot of my most common situations. Before we get into the functionality of the new iPad Pro, we have to discuss the new design. It’s truly incredible. The new iPad Pros are thinner and lighter than their predecessors, and are the first true design shift since the iPad was introduced 8 years ago. While old iPads sported rounded edges, thick bezels, and a home button, this new iPad is flat, sharp, and industrial looking. Gone are the bezels and home button, in favor of a mostly screen design, gestures, and FaceID. 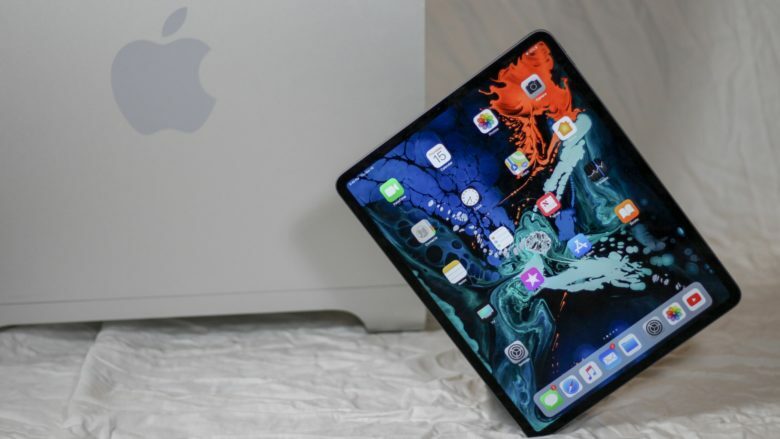 This new iPad is nearing Apple’s ultimate vision of the product – a magical pane of glass that enables you to connect with the world. Outside of the design of the iPad itself, there are a couple accessories to look at before you can truly talk about the iPad as a computer – the new Smart Keyboard Folio and updated Apple Pencil. While these aren’t mandatory for using the iPad – and also increase the cost by $329 US – they are tools that truly enable the iPad to earn it’s “Pro” name. The Smart Keyboard Folio ($199 US) connects magnetically to the back of the iPad, offering a tiny bit of protection. Thanks to the new Smart Connector on the back of the iPad, the new keyboard offers two viewing angles for more comfort in different situations. Unlike the previous Smart Keyboard, the new folio is also a single piece along the bottom of the iPad, which is provides added stability when using it in your lap. Typing on the new Keyboard feels much like the previous Smart Keyboard, with comfortable key spacing, decent key travel, and the soft-touch “fabric” covering. The only downside to the new Keyboard is what happens when it’s not in use. With the old iPad Pro, the keyboard folded into itself when you used the iPad as a tablet, offering a soft fabric covering across the back. With the new single-piece design of the Keyboard Folio, the back of the iPad sports a full keyboard when folded back. Fortunately, the keys are disabled when flipped back, so accidental input isn’t an issue, but it doesn’t feel great under your fingers. The new Apple Pencil is another solid upgrade for the iPad Pro, and comes in at $129 US. 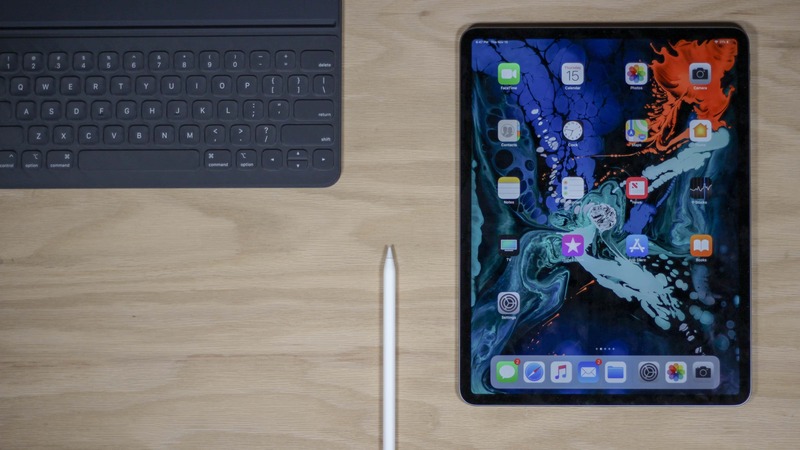 Unlike the previous Apple Pencil, which charged through the lightning port and offered no clear storage solution – the new Apple Pencil connects magnetically onto the side of the iPad for convenient charging and storage. The physical design of the pencil is new, too. Unlike the glossy finish and perfect cylindrical design of the old Apple Pencil, the new one is a soft matte finish, and sports a flat edge that perfectly pairs with the side of the iPad. In use, I personally didn’t notice a dramatic difference in the finish, with both providing about the same grip in my hand. The flat edge of the new pencil does provide some help with orientation – especially when placing it on the charging side of the iPad. As someone who only occasionally uses the Pencil for input, I think the changes are great, so anyone that relies on a stylus with their iPad will likely find the new Pencil a massive improvement. The “Pro” accessories are the key to making iPad work everywhere. Now that the hardware is out of the way, let’s look at using the iPad. Is the iPad Pro really a computer? And what makes this iPad different? First off, there’s FaceID. It’s one of the first things you interact with on the new iPad, and you don’t even see. Whenever you wake the screen, FaceID begins working in the background, unlocking your iPad and giving you a seamless transition into getting to work. Touch ID on the previous iPad Pros was nice, but FaceID feels like a total game changer. Unlike FaceID on the iPhone, with the iPad Pro, it works in any orientation – portrait, landscape, or even upside down – and it’s fast enough that I rarely had a time where I couldn’t get into the iPad quickly. The new gesture-based interface is another big change to the iPad. Any iPad running iOS 12 can take advantage of MOST of the new features, but the implementation on the new iPad makes it clearer and easier. Swiping between apps used to require a 4-finger gesture – which still works on the new iPad – but now you can also swipe on the indicator at the bottom of the iPad to move between open apps. It’s more reachable, and less acrobatic than it used to be, making it a smoother transition than previous iPads – especially when using the keyboard. Every other multitouch gesture is the same across all modern iPads – whether it’s swiping up for the dock or app switcher, or swiping to go home. Then there’s multitasking. This is another feature that exists on any modern iPad, but on the 12.9” iPad Pro, feel more practical. Unlike smaller iPads, the 12.9” iPad Pro allows you to run two full-sized portrait apps simultaneously. This means that instead of getting a pair of compact phone-like apps, you get true iPad class apps. I personally use multitasking all the time to jump between apps. Whether I’m researching and writing at the same time, or taking notes and keeping up with an iMessage thread or Twitter timeline. Being able to easily bounce between apps without losing my place or changing contexts is incredibly useful. Thanks to the new gesture-based UI and incredible processing power, this feels even easier and smoother on the new iPad Pro. It is worth noting that aside from the size of these apps on screen, most of this isn’t limited to the big iPad Pro. Whether you’re using the $329 iPad, a 4th generation iPad mini, or previous iPad Pro models, multitasking is there to make those “computer” tasks easier. When it comes to using the iPad Pro as a computer, this is where things can get interesting. With the 12.9” model, the iPad feels like an iOS-based computer that offers a tablet experience when you want it. Put simply – it’s big. Even with the reduced bezels and thinned profile, the new iPad Pro and Smart Keyboard folio together make for a relatively beefy package. It’s big enough that using it comfortably as a tablet can feel bulky and cumbersome at times. Using it as a computer, on the other hand, feels fun and futuristic. I haven’t had a chance to try out the 11” model, but I suspect that if you want a tablet first and a computer second, the new 11” iPad Pro is your better option. If you prefer a computer first and the tablet is secondary, the 12.9” is where it’s at. Physical size aside, using the iPad adds a layer of convenience that you don’t get with a laptop. I found myself wanting to keep the iPad Pro nearby wherever I went. At times when I would normally reach for my iPhone to look something up while watching TV, or drag my MacBook to a meeting, I was grabbing the iPad Pro instead. The addition of USB-C furthers that use-it-everywhere-ness, albeit with some caveats. One of my most frequent tasks on my laptop is editing photos from my camera. With the iPad Pro, it was as easy as using the SD Card reader I typically pair with my MacBook and importing the images into the Photos app. From there, I can edit them, post them online, or do whatever I need with extensions and apps. Unfortunately, Apple’s current limitations on USB mass storage means that anything that isn’t a photo or video remains trapped on my SD card or portable storage device. While this isn’t something that impacts me personally – most of my files are saved somewhere in a cloud – it is a hurdle that I would love to see fixed in a future iOS release. Cool your jets. The future is bright. There has been a lot of talk online about Apple’s position of the iPad – Some saying it’s the future of computers, others saying it’s impossible to replace a more stereotypical computer with an iPad. To me, it seems clear – the iPad is great at being a computer for most common computer tasks. Sure – it might not be ideal for huge scale audio or video production work, the limitations of the file system may hinder giant print layout projects, and the current set of available apps may not ideal for app developers, but that doesn’t devalue the iPad as a computer. There are tons of incredibly powerful apps that enable the iPad to tackle tough tasks. That said, there are certain tools that are just better suited, or more practical for certain tasks, and there’s nothing wrong with having different tools for different jobs. Obviously no one can know your computer needs better than you, so moving to an iPad is an incredibly personal decision. For me, I’m doing as much as I can on the iPad because it’s fun, the apps are great, and it fits in nearly every situation, but I am also fortunate enough to have a Mac to use a Mac for certain things, too. Apple has made it clear they still care about the Mac. For people that need a Mac to do professional things, it’s still there. For everything else, there’s iPad Pro.